Transmission Engine Teardown bench from Omega Machine & Tool Inc. These are professional teardown and assembly benches. They are not your typical flexy flyer bench. They are the standard of the industry. You will not be disappointed with the quality and materials used in the construction of this bench. We have had people fight over who gets to use this bench in shops where there is only one. If you need one constructed for a unique situation, we're at your service! 10 Gauge top, just over 1/8 thick. Work surface measures 6 feet wide by 3 feet deep. Front edge is 34 high; back edge is 33 high for drain. 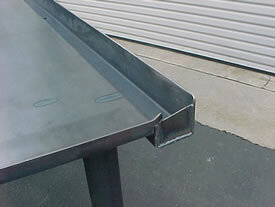 Back edge is full length drain tray, 3 wide. Center drain is threaded for 1-1/2 pipe. Bench legs bolt on for ease of shipping. Legs are 3 angle. Bolt together construction for ease of shipping. Drain can be placed to one end for your application. is bolted to underside surface. You will love the dead top! 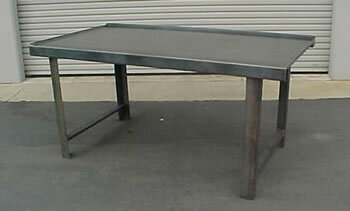 Bench can be made in 6 and 8 ft. lengths. Call for price and availability. Local delivery can be arranged within 50 miles of Sacramento.